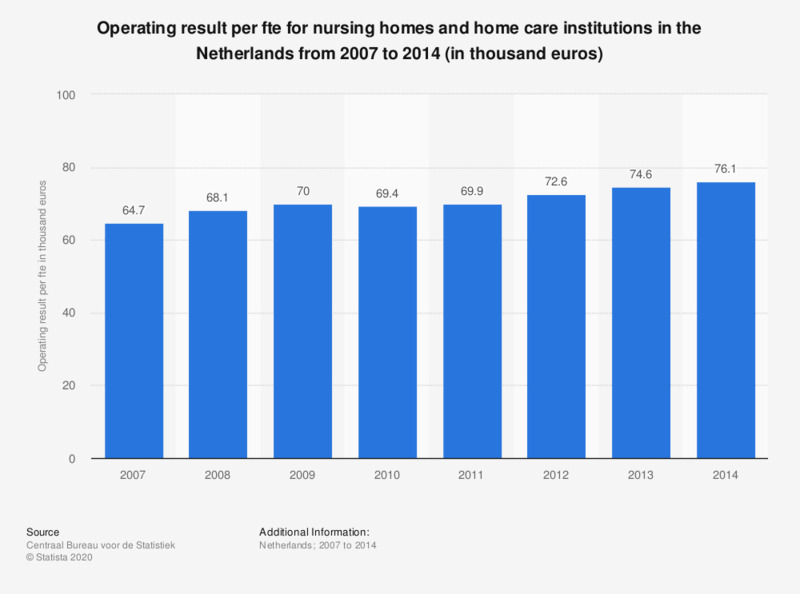 This statistic displays the operating result per fte for nursing homes and home care institutions in the Netherlands from 2007 to 2014 (in thousand euros). It shows that the nursing homes and home care institutions' operating result increased from 64,700 to 76,100 between 2007 and 2014. The source adds the following description: "Institutions providing for care for the elderly and home care in SBI classes 8710, 87302 and 88101 which are wholly or partially funded under the Health Insurance Act (Zvw) and the Exceptional Medical Expenses Act (AWBZ). Excludes institutions providing only maternity care and immunisation authorities. - Housing facilities for terminally ill patients with private nurses, also referred to as high-care hospices. - Housing facilities for terminally ill patients without their own nursing staff, also called ‘almost-home houses’." SBI class 88101 includes: - Nursing, personal and home care at home for chronically ill, elderly and disabled persons and people who temporarily require this kind of care. - Assistance during childbirth, home and personal care for mother and child and provision of information about child care during the postpartum period.